Mmm, cake. Who doesn’t love a slice of the sweet stuff after a long day at the office? Whether it’s celebrating a birthday, enjoying a wedding, or commemorating a birth – there are so many reasons to get out the bowl and spoon and start mixing up a sweet treat. However, there are so many parts that could go wrong that sometimes it’s just easier to pay someone else to do it all for us. Although cakes have been around since the 13th century, it seems as though these deserts have grown to become a massive part of many celebrations over the years. After all, what would a birthday party be without a cake to hold the candles? Sadly, it seems as though not everyone was pleased with their creation. There are many bakers all around the world willing to take on the task of creating the perfect centerpiece, but it seems as though they might need to double check the orders before sending out their final pieces. That is unless they were trying to create hilarious mistake on cakes. It can be hard to know what to put on top of a cake until you see it in real life. After all, it’s one thing to imagine the final piece in your head and another to see it there in front of you. What if there’s not enough room for all those kind words? This customer thought they would help out the baker by being flexible with what they wanted to be written on their cake. However, their act of kindness soon backfired as they were left with this hilarious mistake. Some of us are lucky enough to speak many different languages. It could be from multilingual parents or studying them all at school. Whatever it is, it can be great to celebrate your achievements at any opportunity. 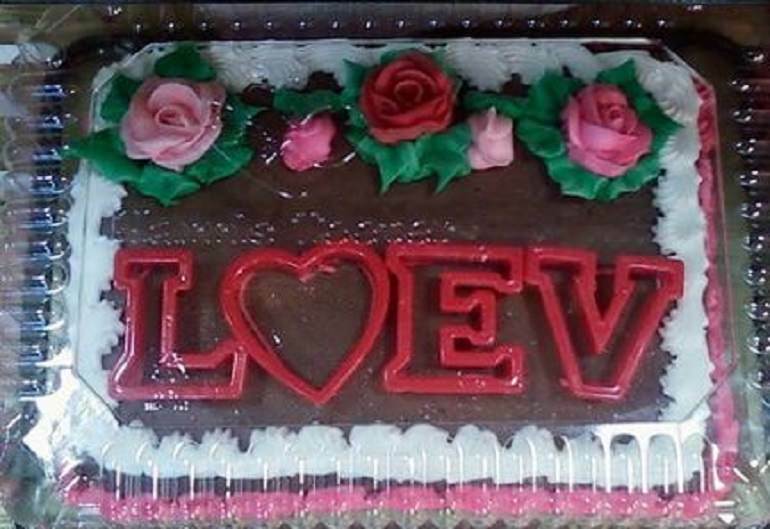 We have to feel bad for the baker here. After all, they might not have been able to speak three languages, let alone ice in them all. Rather than improvising, perhaps they should have headed to a translator first, or at least called the customer? 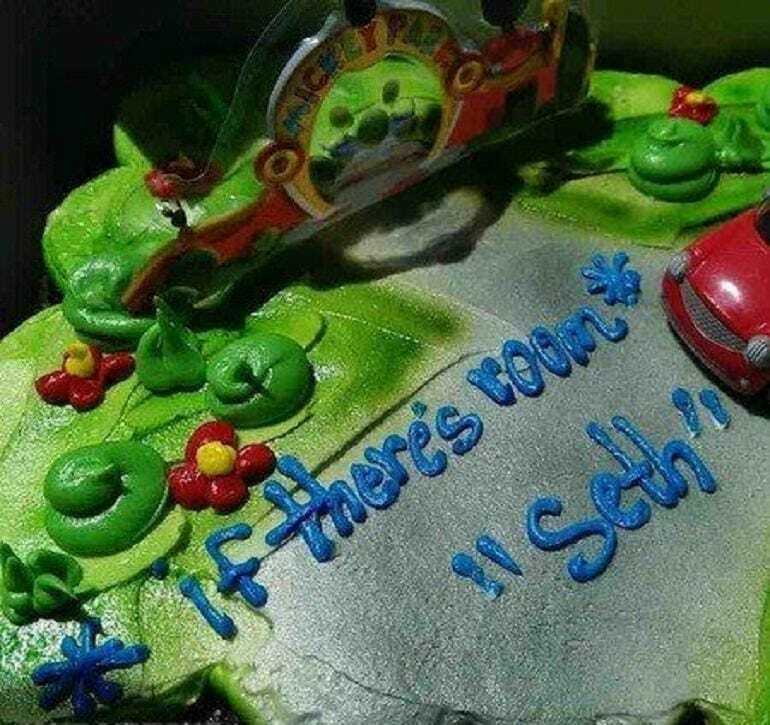 We have to wonder how this hilarious mistake on this cake even happened. 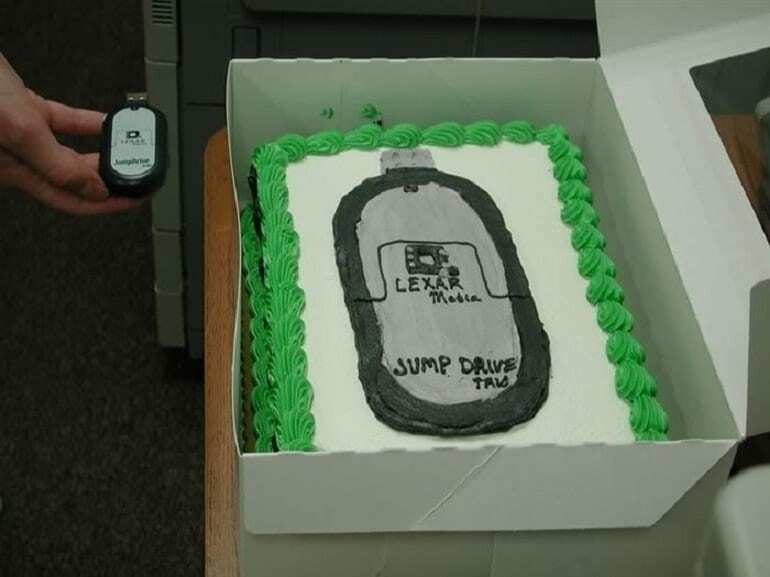 We assume they sent in the USB stick with a photo they would like on the cake. However, it seems as though the bakers were more used to ovens than they were technology as they improvised to create this masterpiece. The level of detail is incredible, but we’re pretty sure it’s not quite what they were after. Maybe next time they should print the photo before placing the order? Piping icing is an incredible skill that can take plenty of work to get right. Getting all the letters the same size and in a straight line can take years of practice to perfect. So when this customer wanted to change the lettering, it looks as though these bakers weren’t impressed. Rather than stick to the guidelines, they thought they would take it upon themselves to remind the customer they have one font, and one font only. It seems as if the customer isn’t always right after all. Those forms can be pretty hard to fill out. Especially when there are so many questions that need answering. How is anyone supposed to get it right? 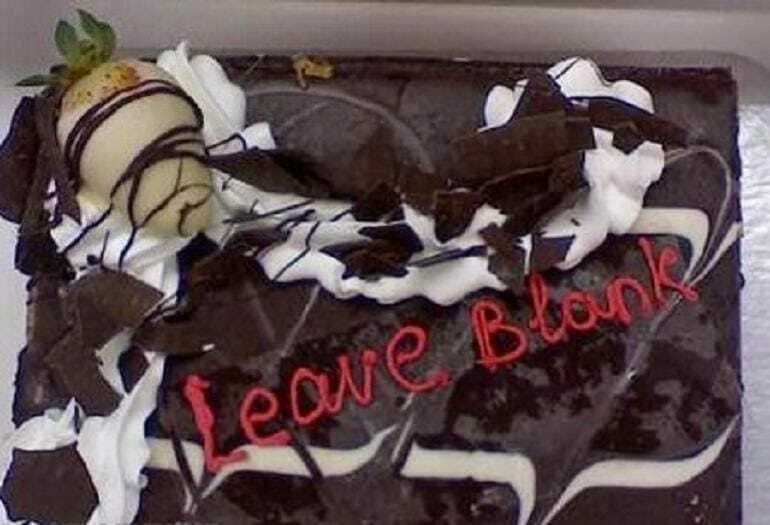 It’s pretty safe to say the customer wanted sprinkles on their creation, but we’re not sure they wanted to eat the words right off the cake itself. 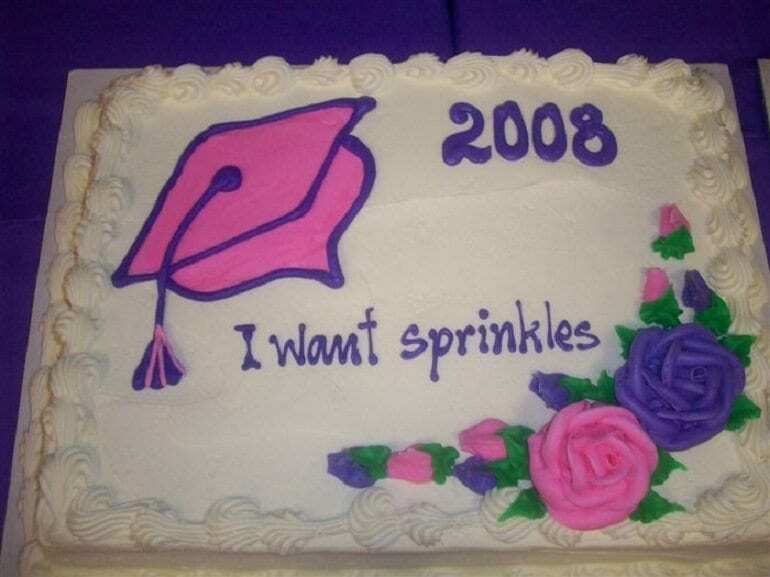 At least now the entire graduation party will know how much the party thrower wished to enjoy a sprinkle cake. Sadly, it seems as though plain will have to do. Oh, the irony of this photo. When filling in the form at the bakers, it seems as though this customer asked for the writing portion to be left blank. Sounds reasonable enough, right? Well, apparently not when it comes to this creation. 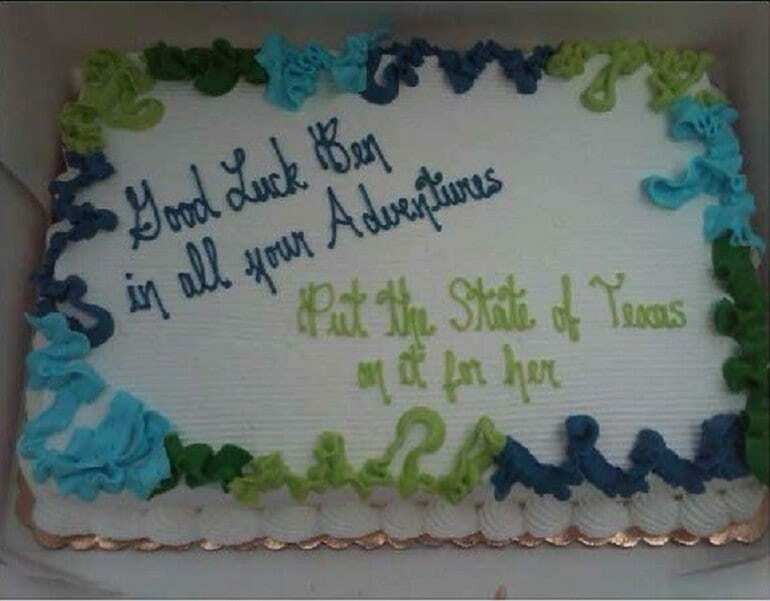 It looks like the person in charge of piping the final cake took the instructions a little too literally and made this hilarious mistake instead. Hopefully, they were able to scrape off the words without anyone noticing. Valentine’s Day is one of the many times of the year we get to enjoy a slice of the sweet stuff. As well as chocolates and flowers, the celebration can also include a cake. As if we need any more excuses to enjoy a slice of the stuff. However, you might not want to offer up this creation if you want to hang onto your beloved. Not unless you use the pet name Loev? 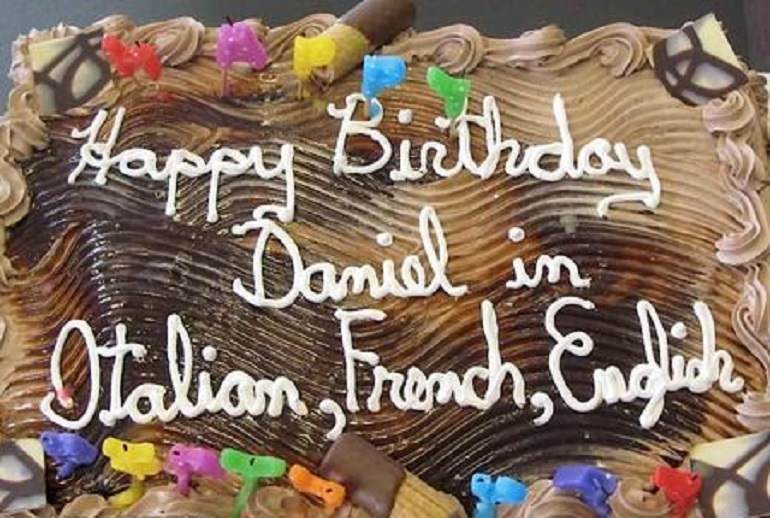 That might be the only excuse we can think of for this hilarious cake mistake. It looks as though this customer was in the market for a chocolate cake. However, they knew the top might need a bit of jazzing up to turn it from plain to wow in no time. Stars and sprinkles are the answers to most things in life, and can quickly transform any birthday celebration. That would be great if the baker doesn’t follow the instructions a little too literally. Hey, they even put the exclamation point on, too. Could it get any better? We hope the baker doesn’t charge by the letter of this customer could be in for a pretty hefty final bill judging by the report they have piped out on top of this masterpiece. Why follow instructions when you could go completely freestyle? 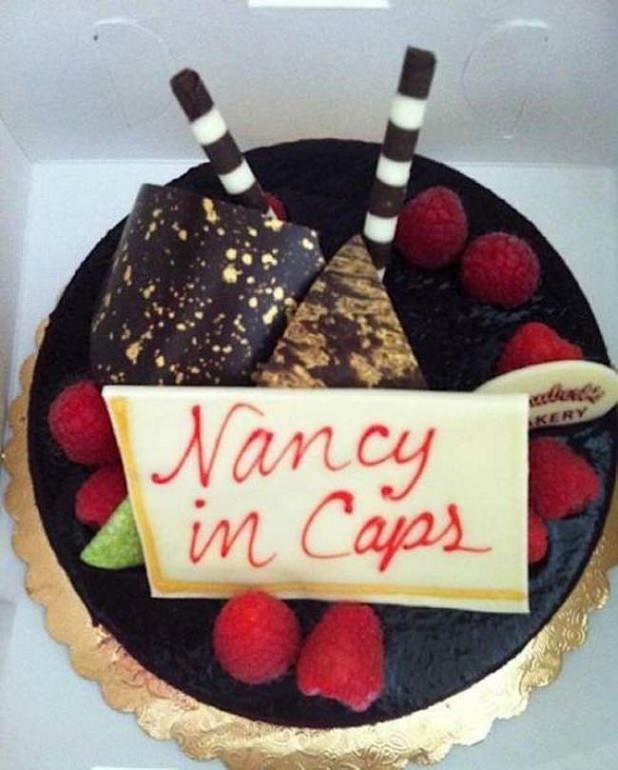 Perhaps they thought the cake might look a little too plain with just one name on top and needed a way to fill it in? At least now Emma Rylee has a talking point of her party. We just hope the cake tasted good. The beginning of a school year can be tough. Not only do you need to meet a new teacher, but it’s time to find a way to get into their good books. 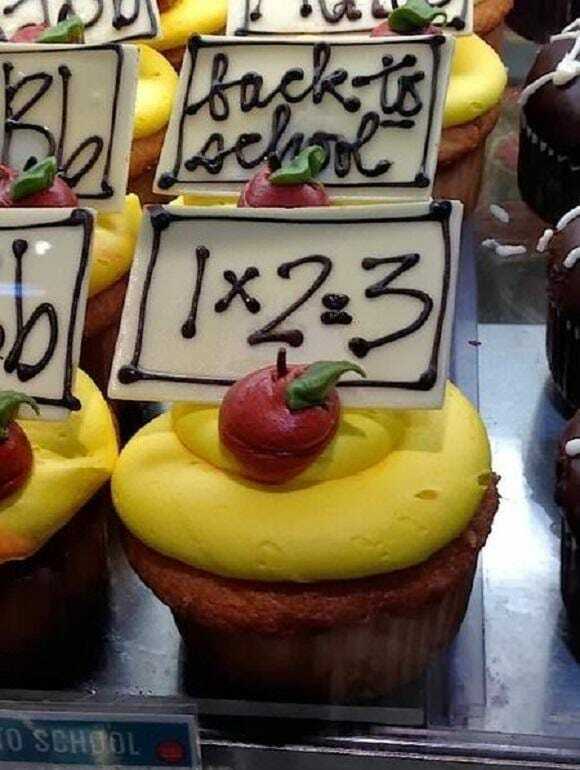 This bakery had the perfect option, why not bring them in a delicious cupcake as an offering? It can be tough asking anyone for their hand in marriage. 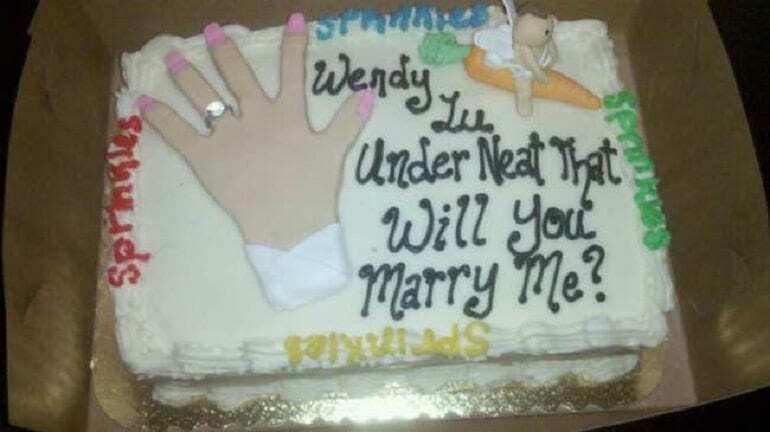 Sure, you could drop down to one knee and go the old fashioned way, but if you really want to spice things up then why not include a cake in it all? After all, we’re pretty sure that’s the way to most people’s hearts. Sadly, it seems as though the grand plan might have to be put on hold after the person opened the box to discover this sweet treat. To top it off, they never even got their sprinkles. Sharing your birthday with someone can be great. Whether it’s a family member or friend, at least you will always have someone there to celebrate with and dance the night away. 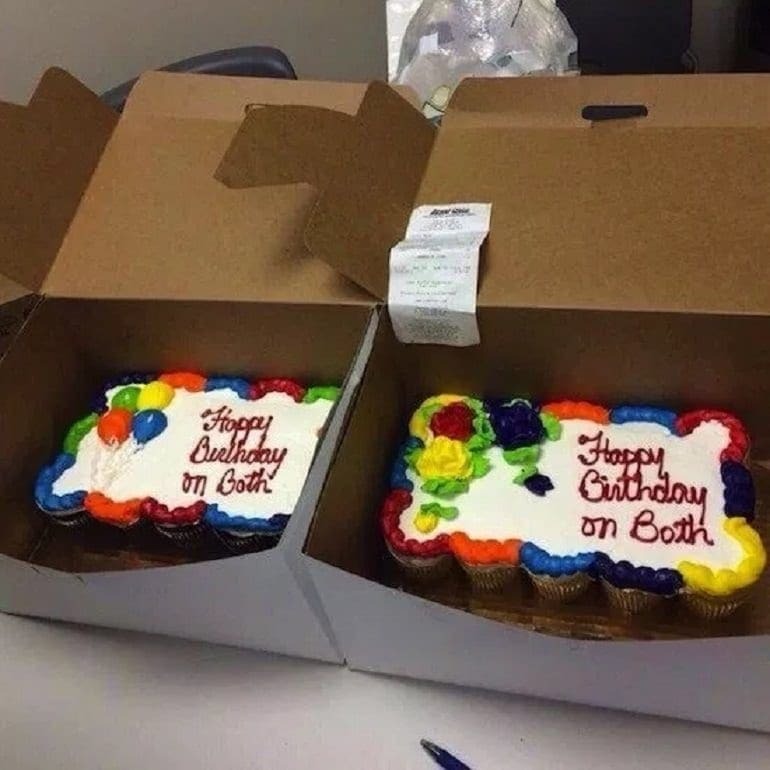 At least this person thought they would fork out on two cakes rather than making them share. That would be great if they didn’t try and save time by filling out one form. Rather than the perfect creations they thought they would get, the birthday people got this hilarious mistake instead. We’re not sure where this confusion came from, but we love the outcome. Sure, the diploma and congratulations might have been a bit of a giveaway. 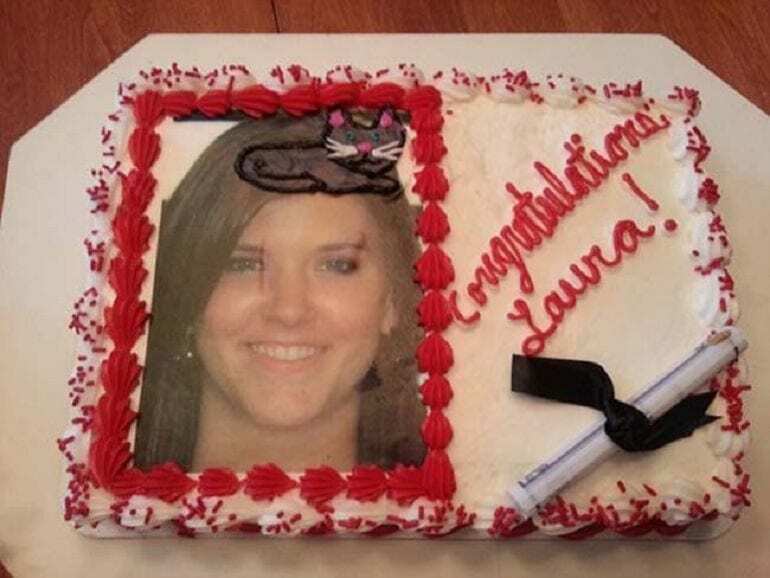 However, the baker still didn’t seem to get the hint that Laura was graduating. That or they really wanted to practice icing animals. Cap, cat – we can see the confusion. Maybe next time they should think about the entire cake before they send off the final piece? Hopefully, Laura saw the funny side of this mistake. One of the best things about being a baker is getting to decorate all the incredible cakes that people request. Kids birthdays can be one of the best times to get creative. After all, all those princesses and frogs aren’t going to ice themselves, are they? 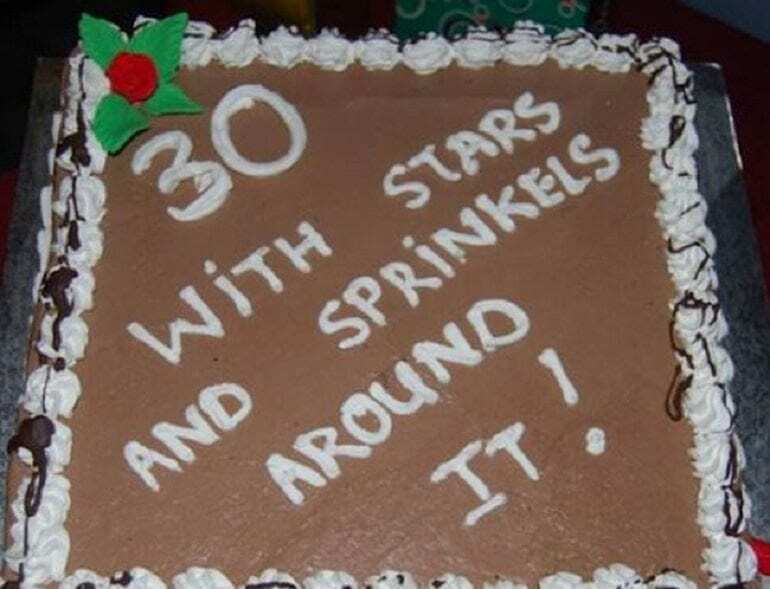 However, it seems as though spelling wasn’t high on either the customer’s or the baker’s skill list after they finished icing this piece. Hopefully, Arika is young enough they can claim they piped it themselves. 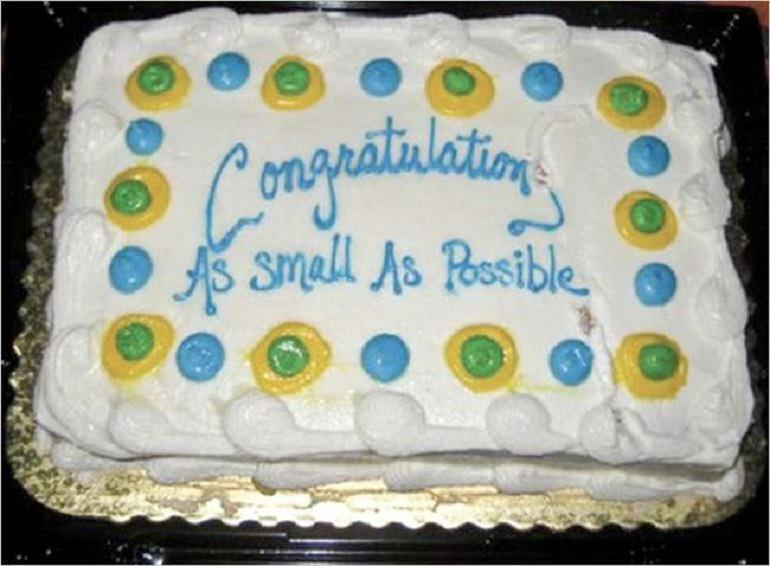 Firstly, we wonder why they wanted congratulations to be written so small in the first place? Were they trying to hide the fact they were celebrating? We think we’ll never know. 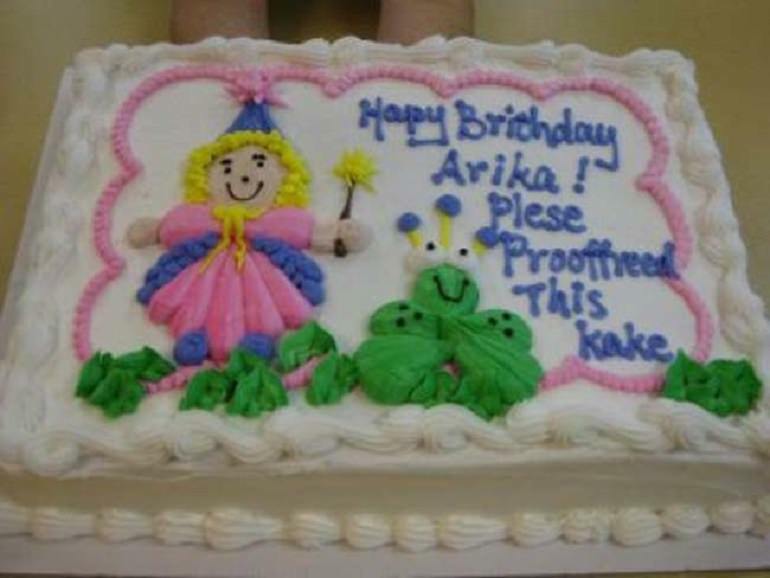 However, the customer got the complete opposite of what they were asking for thanks to this hilarious mistake on a cake. It seems as if someone has already tried to remove part of the writing only to realize then they will be left with a blank cake instead. 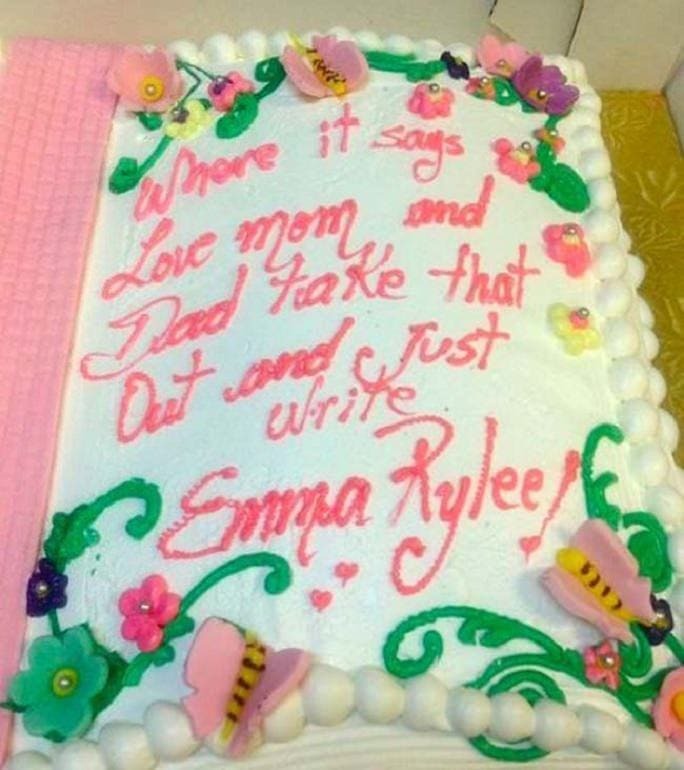 We love the fact the baker has gone to all the trouble of piping two layers of writing onto this cake. Imagine how long it must have taken to get the final results? However, we feel as though a small slice of justice might have been served up to the person that ordered this cake. 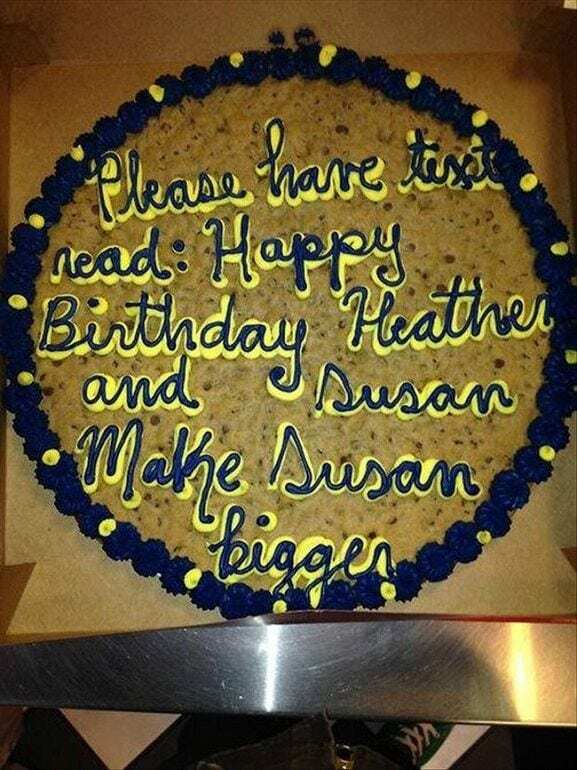 After all, why should Susan’s name be larger than Heather’s? Now, everyone at the party can see who the favorite child is after all these years of wondering. There’s making a mistake on a cake that can be laughed off, and then there is arriving somewhere with this final creation. We wonder how well this wedding cake went down with the bride and groom? We’re pretty sure that someone might have ended up wearing it after they opened the lid to the box. Unless someone was actually really impressed with their friend’s hard work in the yard? Weeding is hard; sometimes even the little things need celebrating. 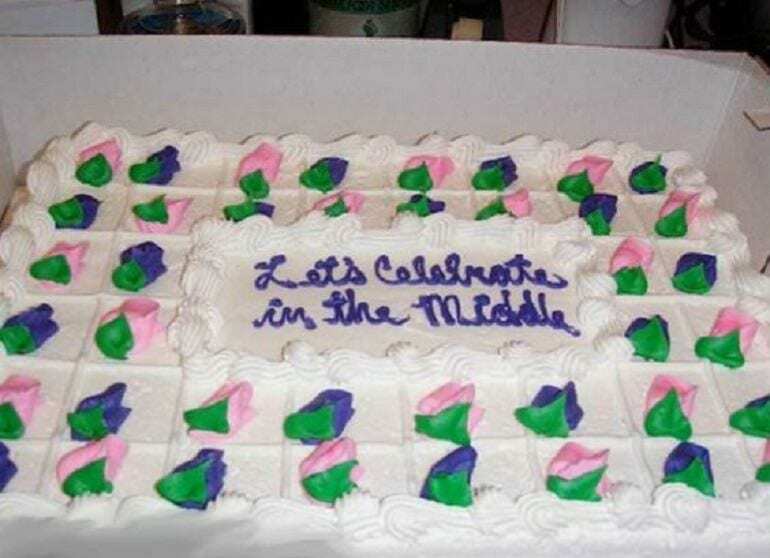 It looked as if the baker started so well with this cake until they made the hilarious mistake. If only they had put down the icing and stepped away from the bake – there would be no room left for those unwelcome additions! 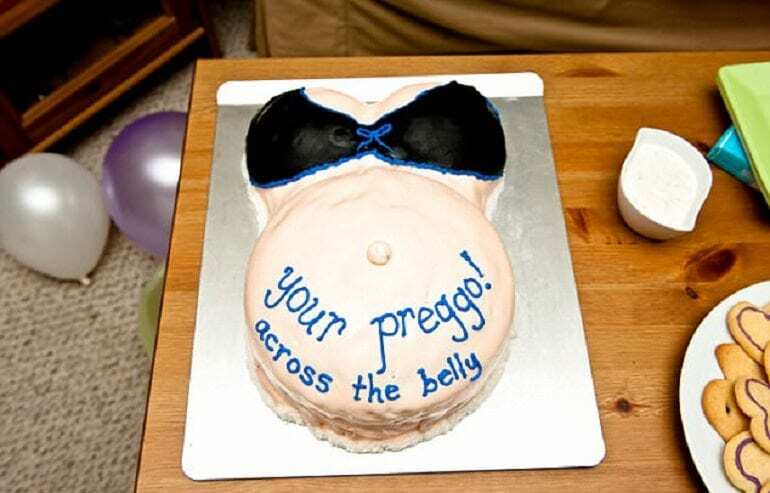 We’re pretty sure the people at this baby shower would have got the point of where the text should be judging by why they were all celebrating, but at least the baker was there to point them in the right direction. We’re guessing that Ben is off on their travels to Texas? The state has been the home of many things, such as Snickers Bars, Dr Pepper, and 3D printing. Now, it seems as if it’s Ben’s turn to put their mark on the world. What better way to commemorate the day they head off than by throwing a party with a huge cake? However, it seems as though the baker hadn’t yet finished the state-drawing part of the course and had to improvise with what they knew. Being a sports star can open up many doors in this world, including a chance to be part of your country’s Olympic team. What could be better than competing for a chance to stand on the podium and receive your Olympic medal? It looks as if this person was about to get their opportunity to shine. Unfortunately, they weren’t going to be heading off to the games with a grand gesture. 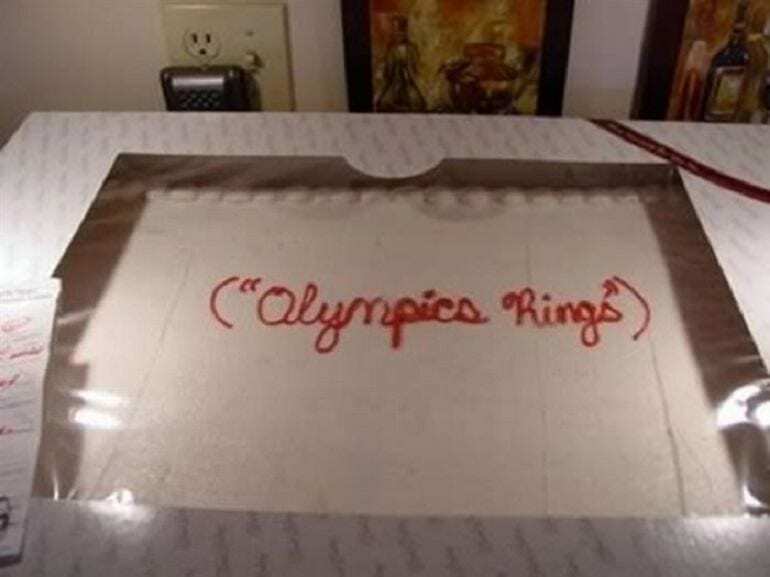 Instead, they got a hilarious mistake on a cake, complete with punctuation and all. We’re not quite sure what is so special about the middle, but, apparently, it’s the place to be if you want to celebrate. After all, this person thought it was so unique they needed to tell the entire party to meet there for a good time. That or the baker got the wrong idea when they read these instructions. Now that we think about it, we think it might be the latter. 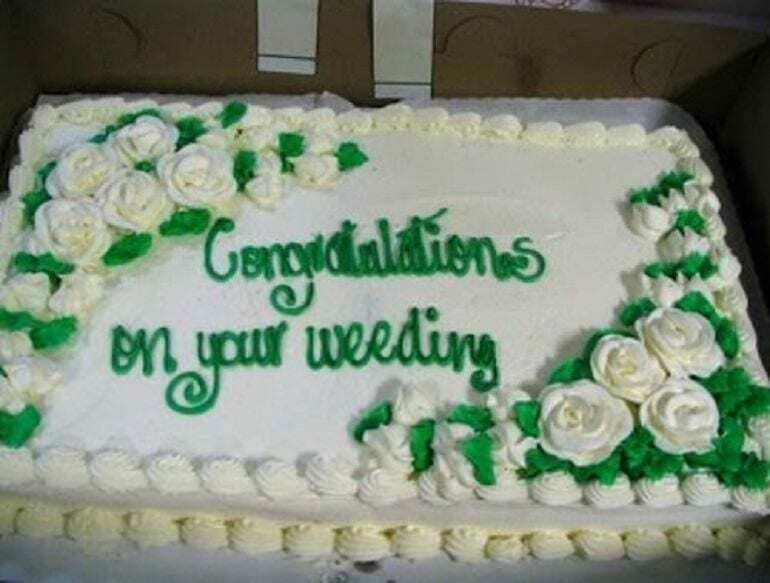 There might have to be a cake “accident” to cover up this hilarious misunderstanding. 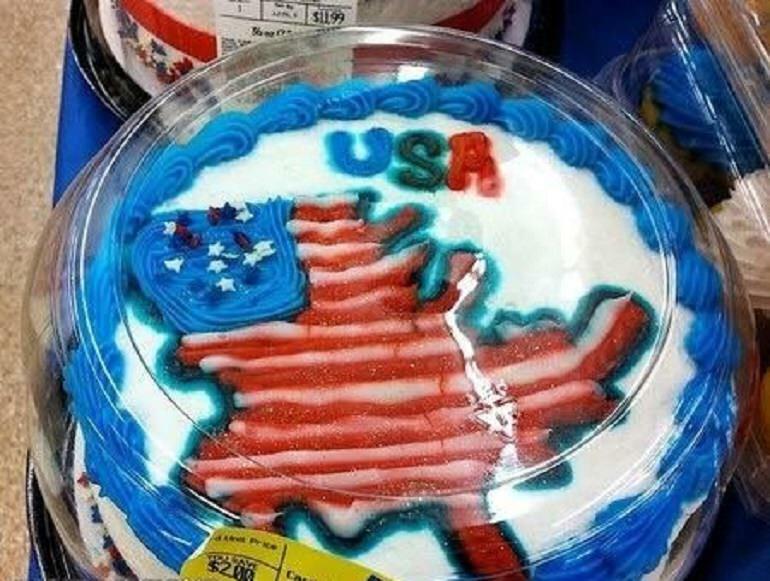 We think it’s pretty safe to say this baker has got a bit confused between the USA and several states in the country. That or they have been looking at a completely different map to the rest of us all these years? 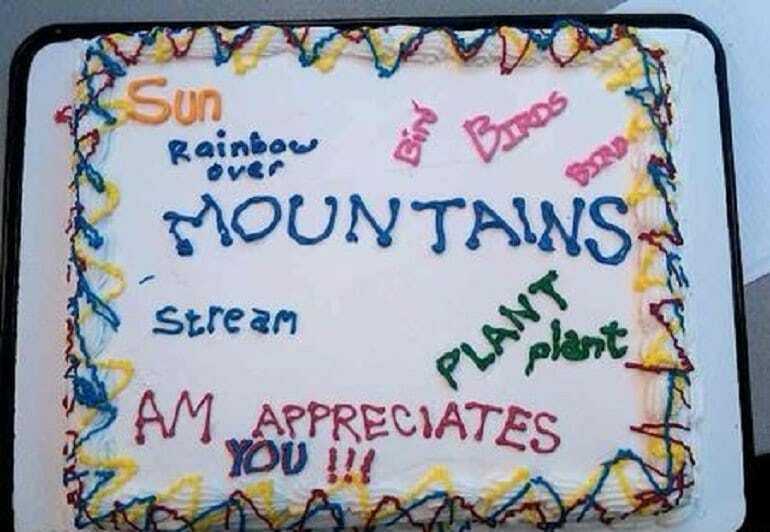 Geography might not be their strong point, but they were still determined to continue on with their creation.we’re not surprised lucky customers get to save $2 off this cake. Just when would anyone be able to use it? It can be hard to describe your creative vision to someone else, especially if you have never met them before. Rather than risking there being any mistakes, the customer thought they would give as clear instructions as possible by writing exactly what they wanted and where they wanted it. Everything was perfect, right? Wrong. 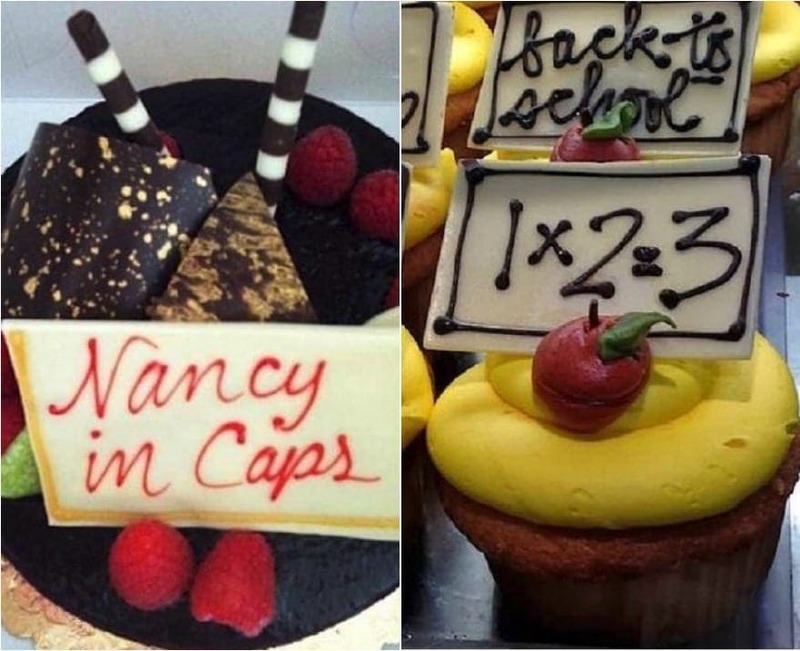 Apparently, this baker doesn’t make requests and would much rather copy a piece than create a hilarious original. Well, it’s certainly unique. This cake could have many different meanings depending on how it’s read. Perhaps a newborn baby was about to arrive at the house wearing pink? 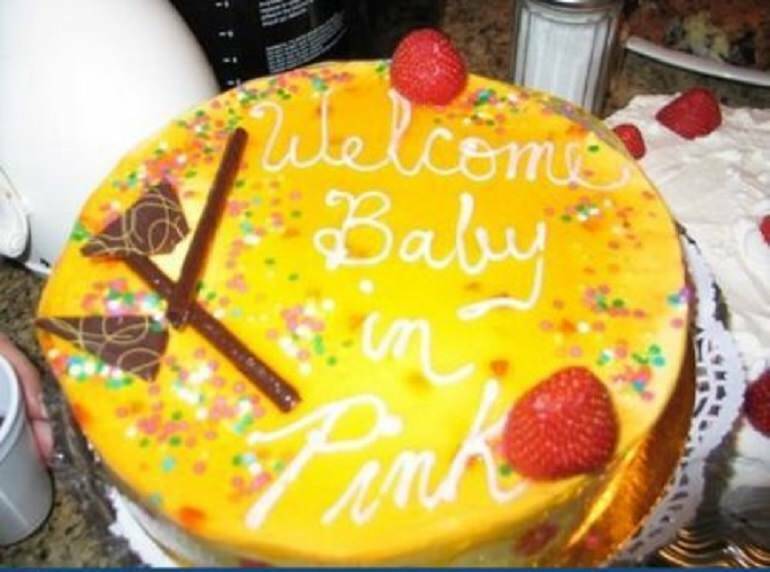 Maybe the baby’s name was In Pink? Unfortunately, we think we understand what they wanted. However, the baker must have thought that pink icing wouldn’t match the rest of the color scheme or forgot to order a batch as they had to improvise with this one. At least it will still taste the same.